Non enveloped, bacilliform particles of 130 × 30 nm. 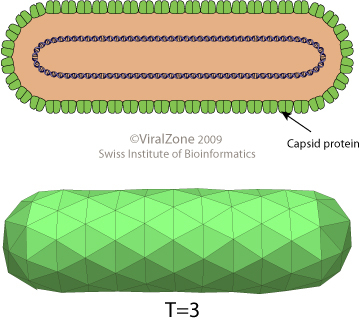 The capsid is presumably based on a T=3 icosahedral symmetry. Circular double stranded DNA of about 8000 base pairs with discontinuities in both strands: one in the transcribed strand and one to three in the non-transcribed strand. ORF2 and ORF3 are expressed by leaky scanning of genomic RNA. CELL TROPISM RTBV is localized in the vascular tissues in Tungro affected rice plants. Virus particle are seen scattered or aggregated in the host cytoplasm, seen alone in the phloem tissues. ASSOCIATED DISEASES Plants: stunting, yellow to orange leaf discoloration with fewer tillers.